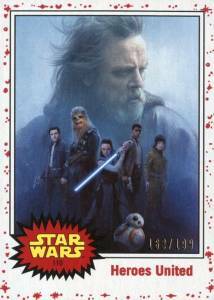 Although geared to Star Wars: Episode VIII – The Last Jedi, 2017 Topps Star Wars Journey to The Last Jedi takes an overall approach to the franchise with a throwback design. Hobby boxes contain two hits with at least one being an autograph. The second hit can either be an autograph, emblem, sketch or printing plate. Paying homage to early Star Wars cardboard, the 110-card base set utilizes the '77 Blue Starfield look with 24-point Heritage stock. Colored parallels change the starfield border fill with Green (1 per pack), Black (1:2), Silver (1:4), and one-of-one Printing Plates (1/1), which count as a hit. Meanwhile, hobby-exclusive parallels include White (#/199), Orange (#/50), Gold (#/25), and Imperial Red (1/1). 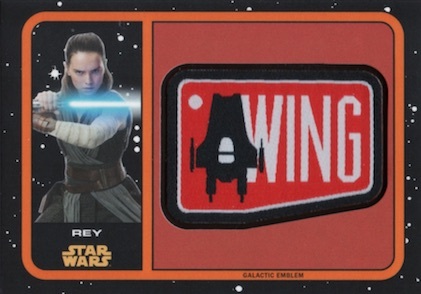 2017 Topps Star Wars Journey to The Last Jedi inserts include the start of a Rey Continuity set (#1-5). There are also Blueprints, Character Inserts, Character Stickers, Darkness Rises and Illustrated Card sets to build. 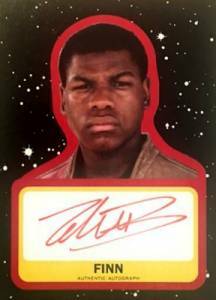 Featuring at least one per hobby box, signed inserts in 2017 Topps Star Wars Journey to The Last Jedi include Base Autographs and parallels: Purple (#/99), Orange (#/25), Gold (#/10 - Hobby), Imperial Red (1/1 - Hobby), and Printing Plates (1/1). 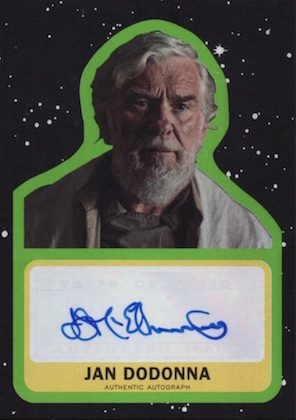 Adding more signers to each card are the Dual and Triple Autographs, along with the very limited Six-Person Autographs insert, which covers The Force Awakens subjects. 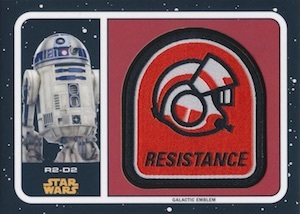 Among the other options falling under the hit banner are hand-drawn Sketch cards for the whole franchise—but centering on The Force Awakens, and Patch relics. 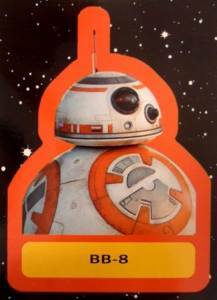 These feature key characters from Star Wars: The Last Jedi in base versions and parallels like Orange (#/99), Gold (#/25 - Hobby), and Imperial Red (1/1 - Hobby). PARALLEL CARDS: Green Starfield (1 per pack), Black Starfield (1:2 packs), Silver Starfield (1:4 packs), White Starfield #/199 (Hobby), Orange Starfield #/50 (Hobby), Gold Starfield #/25 (Hobby), Imperial Red 1/1 (Hobby), Printing Plates 1/1. 80 Maz's band plays on! 81 The First Order Rallies! PARALLEL CARDS: Purple #/99, Orange #/25, Gold #/10 (Hobby), Imperial Red 1/1 (Hobby), Printing Plates 1/1. PARALLEL CARDS: Orange #/99, Gold #/25 (Hobby), Imperial Red 1/1 (Hobby). 5 cards. GameStop only. Shop on eBay. 10 cards. Target only. Shop on eBay. 6 cards. Walmart only. Shop on eBay. 134 artists. Shop on eBay. Good: Solid balance of old and new designs; strong signers list and at least one autograph per box; some pretty cool-looking inserts. Bad: Main Blue Starfield design feels a little stale; manufactured relics are back; would prefer a different autograph design. The Bottom Line: Knowing the intention is to more or less summarize the franchise leading up to The Last Jedi, it obviously is (or should be) expected to feature minimal coverage for Episode VIII. 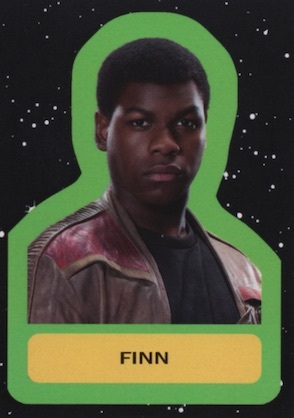 If you appreciate the retro designs of the 1970s transferred across the events in the galaxy, but also look forward to modern designs, 2017 Topps Star Wars Journey to The Last Jedi can accommodate you. 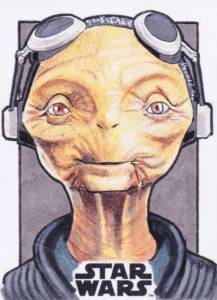 However, it does get stuck in the Topps rut where very few of the designs feel outright new. I’m of the opinion that if you’ve seen one Blue Starfield, you’ve seen them all. 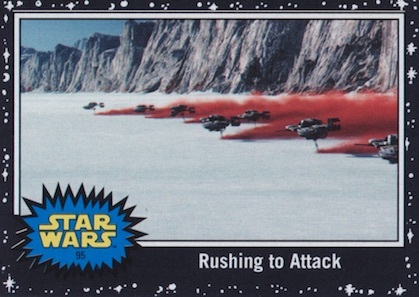 The look is classic Topps Star Wars, but it feels like time for something new, even in a "Journey" product. However, I’m torn on the parallels. On the one hand, they feel excessive, given how basic the set is, but the different colors do help break up the sea of blue. I also really like the white with red stars color scheme. While heavily altered with CGI or artistic finishes, the Character, Darkness Rises and Rey Continuity inserts are captivating, and are the standouts of the product for me. I get that it’s retro-inspired, but I don’t care for the main autograph design. It wasn’t great in Journey to The Force Awakens and I think the same this time. Also, the manufactured emblems come across as hit filler and are very similar to the previous Journey set but with new patches. 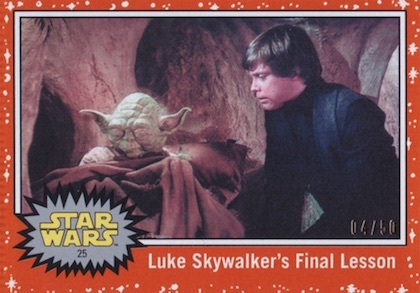 One big complaint immediately emerged upon release for the 2017 Topps Star Wars Journey to The Last Jedi checklist, asserting that it spoiled the December film’s plot. 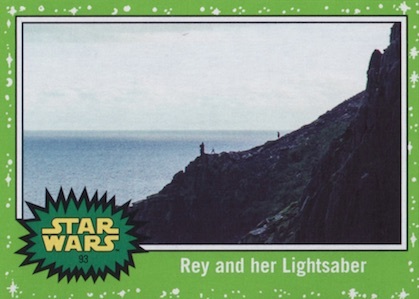 With only trailer images and very basic captions/titles, the 20-card subset for The Last Jedi does not ruin anything and, in fact, it’s an even smaller look at the new film compared to Journey to The Force Awakens, which had 30 cards. 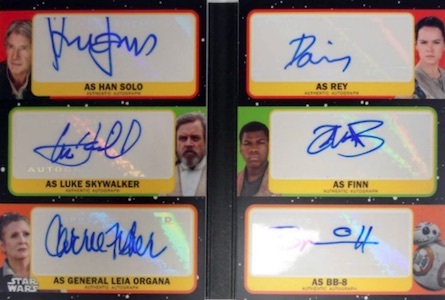 Although the signers list has nearly all the big names from the entire saga, including Rey, Finn, Kylo Ren, Han Solo, Luke, and Leia, the likely short prints (possibly SSP for many) make it much tougher to actually pull a top option. That is the case for most card sets, but it’s important to realize how many lesser names fill out the autograph checklist that has over 60 subjects. 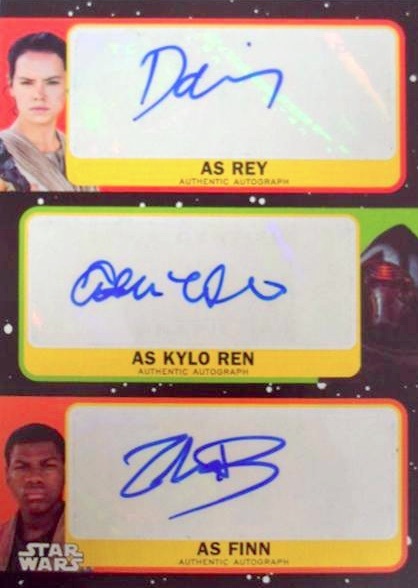 It was a nice addition to add retail-only autograph variations for Rey and Kylo Ren. For $70-80+ per hobby box at the time of this review, the 2017 Topps Star Wars Journey to The Last Jedi value is decent given you know you will have at least one autograph. 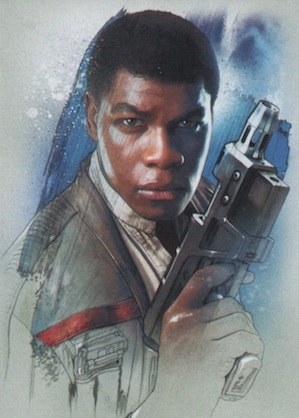 The other hit is the wild card, as it can also be a sketch card or manufactured patch. 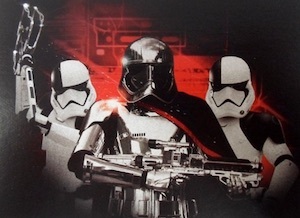 The real problem here is that it is a movie set that really can’t provide much about the movie, or new signers for it, nor does it have a unique design. That hurts long-term value but as the only option until the film releases, it has short-term appeal. However, helping value in the long run is the top-heavy signers list. Because the base design feels a little stagnant, the excitement for me came from some of the parallels and inserts. Luckily, these are in good supply. Boxes really seem to pack a lot in, which increases the enjoyment. I do admit I question the need for a set like this given how loosely it covers the title film, but looking at it for what it is, I liked it. Two quick corrections for your info. Swap the photos for Character Foils and Illustrared Characters, you have them reversed. Also, you can drop Foils from the Character Foils. The packs refer to them as Character Cards and they did not “foil” them in production. 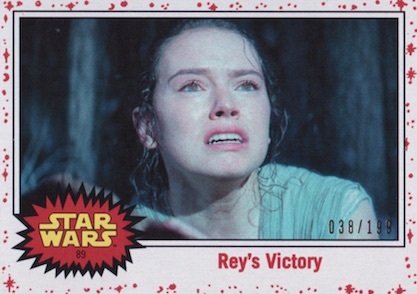 I noticed the Rey Continuity cards are numbered to 15, however, all I seem to pull from packs go to 5. The checklist on this web site says there’s 5 of them in the set. Is there only 5 or am I having a very hard time finding cards 6-15? 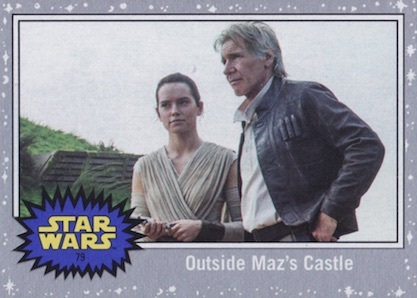 It is the Rey Continuity insert because it’s spread across several sets. 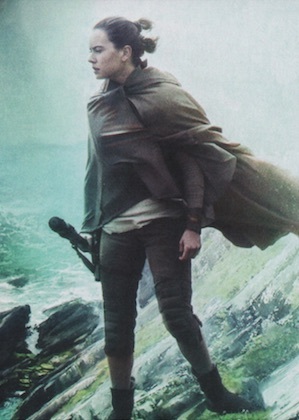 Each Last Jedi set has five Rey insert cards but there is only one out right now so just cards #1-5 are available. The /25 Gold Relics aka Patch cards are also in retail boxes. I pulled one in a Target Blaster box. 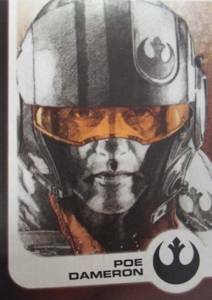 I just noticed, and maybe this is a stupid question, but both cards in the pack I opened that are related to the Last Jedi have artwork on the back, no print or card number. I thought that it was to prevent printing spoilers about the movie as opposed to being an error in manufacturing. Can anyone confirm? 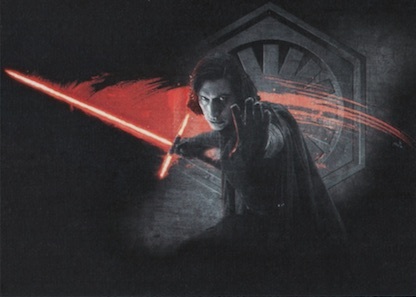 It seems the artwork on the back is only partial and perhaps if you put all the Last Jedi cards together they’d make one big movie poster-like collage? 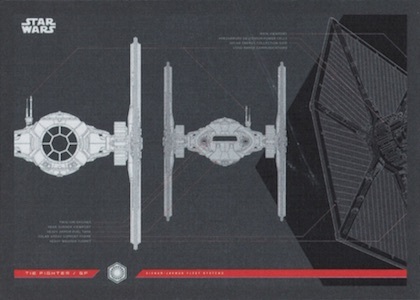 Ben: This is common with the Star Wars sets. They do form a larger image. Looks to be the Topps UK release of a completely different set. It’s not a knockoff. How do I tell who the author or a sketch card is? I can’t figure it out from the signature on the back and the name is not to be found anywhere on the card. Late to the game of collecting but what do the different colors mean? I have blue, gold, purple, black, and silver/white. Are there complete sets of each? They are called parallels. Essentially different versions of the base set with tiered rarity. And yes, you can make complete sets in each color.